The Parc National du Banc d'Arguin (PNBA) in Mauritania is a major breeding area for several species of African water birds and a perfect shelter for the migratory birds from Europe and further afield; more than six (6) million birds cross the Park during migrations and more than two (2) million of them winter, giving the Park the largest concentration of non-breeding waders in the world! The subspecies, balsaci of Eurasian Spoonbill (Platalea leucorodia) is present only in the PNBA. One of the most important nesting sites is on the island of Nair which is two hours windsurfing sail from the village of Iwik. Birds by preference build their nests on the vegetation which lines the fragile dune that acts as a natural barrier on the coast. Unfortunately in recent years, the sea has been gaining ground on the island and progressively flooding nests. To preserve this rare bird, Ahmed and his Imraguen friends created, with the help of FIBA, Natuurmonumenten and the local ONG « Nature Mauritania » filled gaps in the dune by placing sandbags. These sandbag barriers reduce recurrent flooding and enable the vegetation regeneration necessary for successful spoonbill breeding. «These first results are very encouraging but not enough to ensure sustainable reproduction of the birds. We would like to continue our work by reinforcing existing barriers while creating new sand barriers to guarantee the future of M' Boyes (the local name for the Spoonbill)» says Ahmed. My name is Ahmed Ould Meddou. Just like Sidi - our Mauritanian champion - at the Bird Observatory in Iwik, I am Imraguen and an ecoguide in the PNBA. With Sidi, I am a founding member of the Association of Friends of the PNBA. I was born in the village of Iwik, in the PNBA, where I live with my wife and our three children. I am a fisherman; I have always earned my living from fishing. After undergoing training, I became an ecoguide in the PNBA. It is more than an occupation; it is a passion that I pursue alongside l fishing when there are tourists. We are involved in the protection of Spoonbill nests on the island of Nair. Why? Because, I would like my grandchildren to admire this splendid bird which exists only here just like us Imraguens. It is one of the symbols of our land. Its disappearance will be saddening for us all. Through your donation, we will strengthen our work and sustain the Spoonbill population in the PNBA. To achieve this objective, we will need to mobilize about fifteen (15) persons during ten (10) working days. Your donation will be for buying bags made of biodegradable burlaps, shovels, food for the workforce, and paying the fishermen who stop going fishing to help me out and renting the sailboard for the daily transport to the island. For this project, Ahmed will get technical support from the PNBA management, particularly that of its ornithologist Yelli Diawara. Thanks to the financial support from our Ecofund Community, from our ecopartner la FIBA and from the Bank Société Générale de Mauritanie (SGM), the youth association of Iwik and the Association des Amis du Banc d’Arguin (AABA, Association of the Friends of Banc d’Arguin) were able to pursuit last weekend their conservation work on the island of Nair. Remember, in recent years, the sea has been gaining ground on the Mauritanien coast in gerneral and on the island of Nair In the Parc National du Banc d’Arguin in Mauritania (PNBA) in particular, and progressively flooding nests. The island of Nair is one of the major sites for the nesting of the subspecies of the Spoonbills of Banc d’Arguin. The island of Nair is also an important reproduction site for other species of waterbirds and a refuge of the high tide for millions of migratory shorebirds. To stop this tendency, the Association of Friends of the Banc d’Arguin welcomed regulary reinforces the dunes with sand barriers. The innovative thing this time: a group of 8 young Mauritanian bankers from the SGM in Nouakchott participated in the field work. Together with 12 members of the AABA and 2 volunteers from FIBA, the bankers were placing 400 sandbags, in order to restore the dunes of the island of Nair, which are important nesting sites of the Eurasian Spoonbill subspecies (Platalea leucorodia balsaci). The nesting period is about to start. The support and the conservation work came on time. We are confident that our work will contribute to the reproduction of the Spoonbills. Enjoy the photos of our champions, Sidiy Ely (AABA's President), Salla and Antonio (FIBA), youth association from Iwik and AABA, and our bankers from SGM. Dear Ecofund Community, please find below the accounts of donations to the project and its expenditures. In November 2012 and February 2013 the youth association of Iwik and the Association des Amis du Banc d’Arguin (Association of the Friends of Banc d’Arguin) together with the NGO Nature Mauritanie carried out recovery projects on the dunes of the island Nair. As you know the island is in danger of disappearing, due to erosion and frequent floods. This situation has gathered the Imraguen youth to take action and restore the dunes. 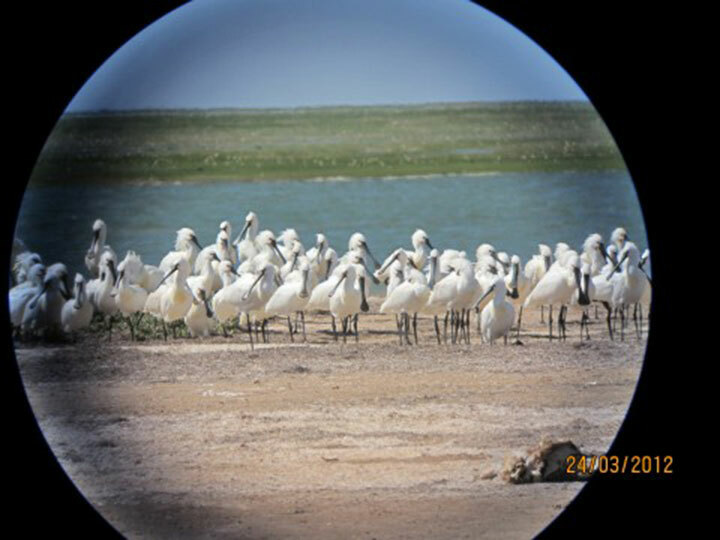 Especially since the island is one of the most important nesting sites of the Eurasian Spoonbill subspecies(Platalea leucorodia balsaci), which lives only in the National Parc Banc d’Arguin and as a result their population has been declining for a few years now. The recovery consists of sealing off the open gaps towards the sea with biodegradable bags, a simple and effective method with satisfactory results so far. The plants are beginning to come back, catching the sediment and strengthen the dunes. The Association of the Friends of Banc d’Arguin and the youth association of Iwik wish to continue rebuilding the island in January 2014, before setting up the Spoonbill colony, in order to reinforce the work that has already been done and continue to fight against the effects of global climate change. We hope to count on our Ecofund community so that we can restore the dunes of the island Nair, which is not only significant to the future of this species but also the mobilisation of the Iwik youth for the conversation of their biodiversity. Help us to finance the gap of 900 euros! For several decades have the effects of global warming been evident around the world. Climate change has an impact on the coastlines, the biodiversity, the populations that depend on maritime resources and the environment of the coasts, especially in the zones with low depth like the estuary regions, often protected by a string of narrow dunes and endangered by human interference. In the Parc National du Banc d’Arguin in Mauritania (PNBA) the local population, the park officers together with national and international partners act in order to stop the process of erosion of the island of Nair. The island of Nair is one of the major sites for the nesting of the subspecies of the Spoonbills of Banc d’Arguin. The island of Nair is also an important reproduction site for other species of waterbirds and a refuge of the high tide for millions of migratory shorebirds. Between the 21st and 23rd February 2013, the PNBA organised along with the FIBA, l’Association des Amis du Banc d’Arguin and the Youth association from Iwik, the first intervention of the year, to rehabilitate a sting of dunes on one side of the island. For the first time since the launch some years ago, the volunteers from Nouakchott, the capital of the country and the Dutch researchers assigned by PNBA, have been accompanied by 17 young women and men from the Iwik village. During the rehabilitation intervention, 400 biodegradable jute sand bags have been deposed on the critical points of the southern zone of the island where the most important colonies for reproduction are situated. The results of the past efforts are remarkable and very visible on site. The typical halophile vegetation of this zone has developed a lot thanks to the bag-barriers and the rehabilitated zone of the island unveils a remarkable resilience to floods, a great source of hope for the future. For some time now, some major changes can be seen along the Mauritanian coast. The coast line tends to recede progressively. Often during the year, certain villages are isolated due to flooding by the sea and this does not happen only during periods of high tides in the year. Breeding colonies of certain Spoonbills are automatically flooded and this phenomenon is becoming particularly worrying because of the endemic subspecies of Spoonbills - the Platalea leucorodia balsaci. Bird colonies in the islands of Cheddid and Touffat have been deserted for some years now and on the islands of Nair and Zira, nests are often flooded. To stop this tendency, the PNBA has set up, in the past with the support of several international partners particularly the International Foundation for the Banc d’Arguin (FIBA) and in strict collaboration with Nature Mauritania (NGO) and the youth association of Iwik village, nesting platforms on these islands. Concerted efforts have been made in recent years to reinforce the sand barriers on the island of Nair and these have yielded very encouraging results. From the 28th to the 29th of November 2012, youths from the Iwik village and from the Association of Friends of the Banc d’Arguin welcomed the organising team that came for the reinforcement of the sand barriers in the island of Nair. Forty (40) persons participated in this activity including about 30 men and women from Iwik village, the Nature Mauritania team as well as participants from the PNBA and the FIBA. The participants reached the island of Nair by « lanches », the traditional Imraguen sailing boats, where 600 sandbags were placed at the different crevices made by the sea and around the Spoonbills’ nesting area. This action will need to be carried out soon again to consolidate the work that has so far been carried out. FIBA has already provided 1,775 of the initial budget of 2,675 euros. Reinforcing the dunes of the island of Nair to enable the Spoonbills breed peacefully. For some time now, some major changes can be seen along the Mauritanian coast. The coast line tends to recede progressively. Often during the year, certain villages are isolated due to flooding by the sea and this does not happen only during periods of high tides in the year. Breeding colonies of certain Spoonbills are automatically flooded and this phenomenon is becoming particularly worrying because of the endemic subspecies of Spoonbills - the Platalea leucorodia balsaci. Bird colonies in the islands of Cheddid and Touffat have been deserted for some years now and on the islands of Nair and Zira, nests are often flooded. Our ecopartner, la FIBA, decided to contribute 2.225 euros to the budget of the Spoonbills of Nair project in Mauritania. Many thanks to la FIBA! La FIBA's contribution reduces the initial project budget of 4.900 euros to 2.675 euros. With the 180 euros raised till today, there are still 2.495 euros to be raised: hurry-up !!! Our ecopartner, la FIBA, decided to contribute 2.225 euros to the project budget. Many thanks to la FIBA! Ahmedou, our mauritanian champion of the Spoonbills of Nair project, contributed to the summer camp "Khaimaazrakh", which took place from the 3rd to 11th September 2012 in Iwik. The camp was attended by 10 children from the schools in the National Park of Banc d'Arguin (PNBA) who had followed activities aiming to “discover the landscapes of PNBA” during the previous school year. Ahmedou and other camp educators accompanied the children to the Isle of Nair to raise awareness of the climate change issues and the rising sea levels that affect the reproduction of the colony of spoonbills on the island. The children used photography to report on the situation and the problems addressed. They discovered for the first time the island which is one of the highest nesting places for one of the most emblematic species of PNBA. Ahmedou contributed to the summer camp "Khaimaazrakh", which took place from the 3rd to 11th September 2012 in Iwik. The camp was attended by 10 children from the schools in the National Park of Banc d'Arguin (PNBA) who had followed activities aiming to “discover the landscapes of PNBA” during the previous school year.